Perfect Picture Book Friday – Double Feature! 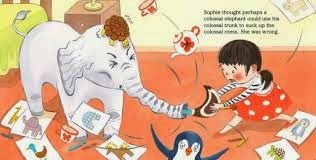 – Sophie’s Animal Parade AND Dress Me! I’m reviewing two picture books today! Opening: “Everything Sophie drew came to life. Mama called it Sophie’s imagination. Sophie called it magic. When Sophie felt hungry, she drew something scrumptious to eat. When Sophie felt sleepy, she drew somewhere cozy to rest. 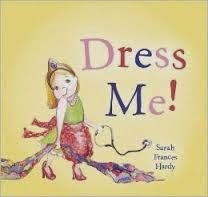 Brief Synopsis: A little girl tries outfit after outfit, exploring the many possibilities of what she can be- dancer, artist, teacher, lawyer etc until she finds just the right one. Links To Resources: think up 3 careers you’d like to try. Do any of them require special outfits or equipment? If so, what is required? See if you can find or make some items so you can dress up like the people in those careers. Play charades and act out a job/career you’d like to try – fireman, doctor, plumber, lawyer, carpenter, teacher, minister, etc. Why I Like This Book: With simple text (the word count is 44!) and adorable illustrations, a little girl tries out being a dancer, an artist, a monster, a doctor, a plumber, and many other things. In each case, her little dog is right alongside her, joining in the fun and often sporting his own accessories. This is a wonderful story that makes exploration, self-discovery, the freedom to choose who you are and what you want to be accessible to youngest readers. Sweet and fun. PPBF bloggers please be sure to leave your post-specific link in the list below so we can all come visit you! I can’t wait to see this week’s bounty of books!